On Saturday, December 1, 2018 the Greater Phoenix Gay & Lesbian Chamber of Commerce (GPGLCC) celebrated a decade of giving by hosting their 10th Annual Festival of Trees at Ballet Arizona, which brought a record-breaking 400+ attendees and raised over $40,000 for four local LGBTQ non-profits, One-N-Ten, the Phoenix Pride Scholarship Program, the Phoenix Metropolitan Men’s Chorus and the GPGLCC. Attendees gathered to kick-off the holiday season with emcee Jared Dillingham of 3TV Arizona’s Family by enjoying a sold-out VIP reception followed by bidding on 11 holiday trees exquisitely decorated by local designers; a silent auction which featured holiday wreaths, menorahs, resort stays, and more; and raffles for three trees, a fully stocked wine fridge and a grand prize travel tree, which included a seven-day all-expense paid trip for two to Amsterdam. 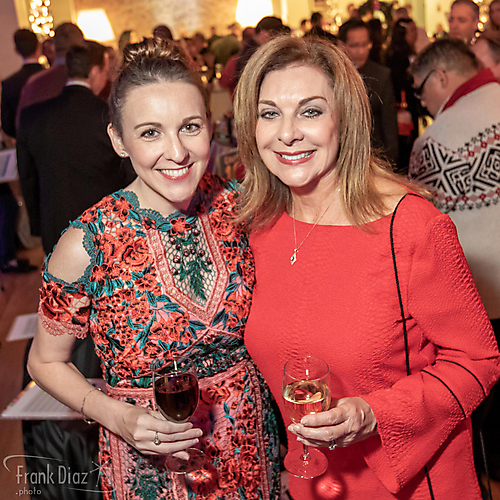 Holiday musical entertainment was provided by the Uptown Angels and the Phoenix Metropolitan Men’s Chorus and heavy hors d'oeuvres were provided by local restaurants and caterers. Aaron Curiel of Velvet Buttercream won this year’s inaugural Golden Spoon Award, which honored the best food of the evening as voted by the attendees. The Paul Riley Best Designed Tree Award went to George Alvillar, Chad Austin and Matt Looney, who have been decorating breathtakingly beautiful trees for Festival of Trees for the past three years. Presenting sponsors of this year’s event included JP Morgan Chase, Biltmore Fashion Park, and Muscular Moving Men.